So besides sticking a microphone in Mr Dane and Mr Story's face every 5 minutes for comment on the matter. What would be the process now? 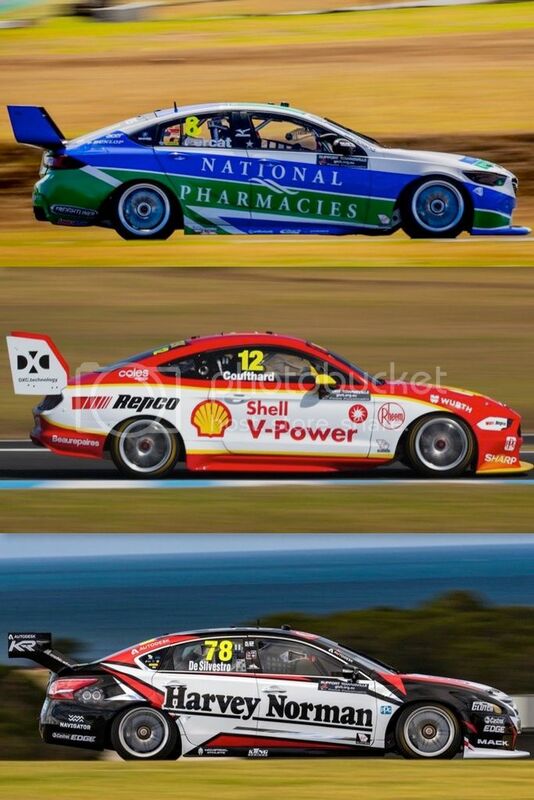 One thing for Holden teams (Nissan too) and their fans to scream parity, but I'd imagine they'd have to pinpoint the actual cause to Supercars to trigger a review? You’re making the incorrect assumption that their aero last year was worse than the Commodore. At most of the high aero circuits Ford were as strong if not stronger. I wonder if there's still a procedure for assessing an average laptime across the different marques and expecting it to be equal to within a given range? What is striking is that without even new chassis, 5 of those cars have been turned from relative trucks, with drivers who were viewed as also-rans, to being contenders. But one track, twin spring change, lets see if the coming events bring the Super Stangs back to the field. Obviously solution at this point would be to tell Ford, etc to go back to the drawing board on the front end. Predicated on the hypothetical that there's an inequality that was able to get through the testing, that is a result of them departing from the road car's aesthetics deliberately to achieve a specific outcome. There's no doubt that Penske are smart enough to have done the work to do such a thing, but if they did, and by doing so obeyed the rule but ignored the spirit or intended interpretation of the rule, how could it be dealt with? Penske as an organisation has form for being ruthlessly competitive to the point of bending rules. Their NASCAR team was belted in 2013 and again in 2017 (after winning 1/3 of the races) for serious infractions, and Roger himself loves to say "we were not cheating, we were working in a grey area of the rules". NASCAR is a whole lot more stringent on policing rules than Supercars. An even bigger "rule bender" was the former owner of HRT. Interesting to see Holden fans discussing parity, yet Holden haven't lost the upcoming races just yet. Very proactive indeed. I hope not. That would be assuming all teams, drivers, engines and equipment underneath the bodies are of equal quality. Add to that, it could be skewed by the different quantities of makes. 14, 6 & 4. GRM, Tekno and the Kelly Krate would skew the results too much. I agree more track time is needed. I don't believe 888 have bought their linear spring A game yet. In the meantime, enjoy the social media blow ups! Who said Ford v Holden rivalry is dead. The front shot of the Race2 grid told a story. The bonnet line of the ford is so much lower than the ZB, like night and day. looked like a car from another category had come out for the wrong race. The aero that Supercar's have allowed the ford is a BIG step away from the previous cars in the category. check out the rear wing extension off the boot, or is that a secondary wing? looks like a wing! If 888 and presented a car as modified as this ford Ryan Story would have been on BGT or the Voice. I've not mentioned the ballast weight the fords can moved round their cars in low slung components. Maybe another time must fly. The aero that Supercar's have allowed the ford is a BIG step away from the previous cars in the category. check out the rear wing extension off the boot, or is that a secondary wing? I don't think that's the case at all, my only thought is that my artificially dropping the nose, they have achieved the aero target with an artificially low drag result on the front, and in the process made the thing look munted. The rules explain the odd glasshouse but the front looks to be pure performance. I recall people made the same comment about the Nissan wing, and the ZB. I think this is a product of smaller cars having to fit the same hard points in the design. Probably a reasonable comment given they are racing this weekend for the Larry Perkins Trophy and Larry himself once had a infamous outburst about others sandbagging. The VF and ZB had and have an extension off the boot to place the wing in the right spot for the rules, its flat. the Mustang's is not flat and has a turn up. Funny little chat after Race1 with Story right in Scott's face after the race, before anyone could interview Scott. Any lip readers in tonight. And it wasn't the BS Scotty said it was. It was a debrief off radio, don't make any comments about the car being really fast or a jet. As he'd just driven away from everyone. If I recall correctly, there is a predetermined size of bootlid area that the teams can work with. Which means they can extend an existing bootlid to meet that figure. The distance from the top of the front wheel arch to the top of the guard looks higher on the stang, hence the nose drops more.